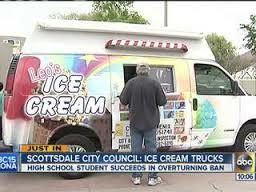 Scottsdale Ends Ice Cream Freeze-out! Kid Knocks Council Out Cold! The headlines may be fictional, but the inspiration for them isn’t, as our neighbors over in Scottsdale can attest. You might say it has churned up some controversy. *For all those poor, deprived kids in Scottsdale, I have provided a link to the Wikipedia page for ‘ice cream truck,’ which gives a comprehensive description of the vehicle as well as a general overview of the service the operators provide. Who is it that all those children, not to mention all those other people who are just too lazy to drive to the corner to buy their Choco-Tacos, have to thank for this remarkable reversal of fortune? The unlikely hero (or villain, depending) is an 18-year-old high school senior by the even unlikelier name of Leo Blavins. Almost two years ago, Mr. Blavins bought an ice cream truck for the purpose of starting a business, only to discover that the reason he thought it was such a good business opportunity – namely, the conspicuous lack of ice creams trucks in the area – was not due to some oversight on the part of hapless fellow entrepreneurs, but because the practice had been prohibited by city ordinance long before he was born. While most of us, especially at the tender age of sixteen, would have frozen up in the face of such obvious futility and focused instead on turning our ice cream trucks into supreme-mega-ultra party vans in time for prom, Mr. Blavins chose to challenge the status quo. It only took eighteen months, but last week’s announcement means he will at last be allowed to realize his greatest dream, which, if it were me, would be to drive up to the steps of city hall in said ice cream truck, hand out complimentary fudge pops to the recalcitrant members of the city government, and tell them to stick it where the sun don’t shine. But, perhaps Mr. Blavins isn’t as vindictive as I am. 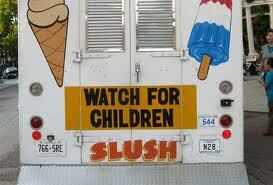 That’s why they have to be fudge pops. 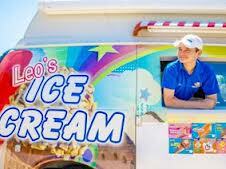 In an ironic twist of fate, Mr. Blavins doesn’t even own his ice cream truck any more, having sold it so that he can go off to college in the fall, presumably as a professor of economics, or perhaps political science. And so, as often happens in situations like this, it will be Mr. Blavins’ successors who reap the benefits of his pioneering efforts to stand up against such ugly and virulent discrimination. In some ways, it parallels the story of Jackie Robinson in the recent film 42. 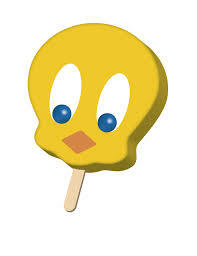 Except that instead of a black man standing up against the racial prejudices of a nation while holding nothing more than a baseball bat, it’s a white kid in a privileged town waving a Tweety Bar. Kites. Many people don’t realize this, but Scottsdale was the first city in the country to ban kites in 1966. 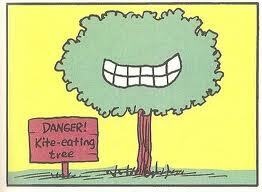 The city was thoroughly alarmed to discover the growing threat posed by kite-eating trees, as famously illustrated by Charlie Brown’s recurring encounters in the comic strip Peanuts. “The feeling amongst the community at the time was that kite-eating trees might become too accustomed to the presence of children and turn into kid-eating trees,” recalled Etuncia Lopez, a neighborhood activist who, as a child, was involved in generating support for the proposed ban. “Some people felt that kite-eating was merely a ploy on the tree’s part, luring the children up into the trees after their kites, and then swallowing the pobrecitos ninos (poor children) whole.” Prior to banning kites, the city attempted to outlaw the kite-eating trees themselves, but horticultural experts were unable to identify the exact species type based on existing evidence, which consisted only of several rather crude drawings of a single-trunked tree with a bushy but very generic canopy of leaves, and, in some instances, a smile. Small, furry animals. 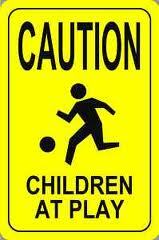 The sharp rise in child abductions in the 1980’s led the city to ban all types of small, furry animals. “Think about it,” Cliff Hendershaw, a Scottsdale resident who spoke at a public hearing on the proposed ordinance said, “If you want a kid to get into a car with a strange man, a small, furry animal is your best bet. In fact, I’ve tried many different things; candy, toys, credit cards, and the one thing I can say kids respond to every time are small, furry animals. Bunnies, kittens, puppies, and for some reason, especially ferrets.” Mr. Hendershaw was immediately handcuffed and hustled off to jail, but the council took his advice anyway and passed the ban. So, rest assured, people of Scottsdale. Although you have sacrificed a small bit of security for an even smaller, but tastier, bit of freedom, many substantial protections for your children remain firmly in place. And for those of you out there looking for the safest possible place to raise your kids, you could do worse than Scottsdale, Arizona, where even the ice cream isn’t above suspicion.